Spring is here and a time for many celebrations such as wedding and baby showers, graduation parties, Mothers Day, and this week – Easter. 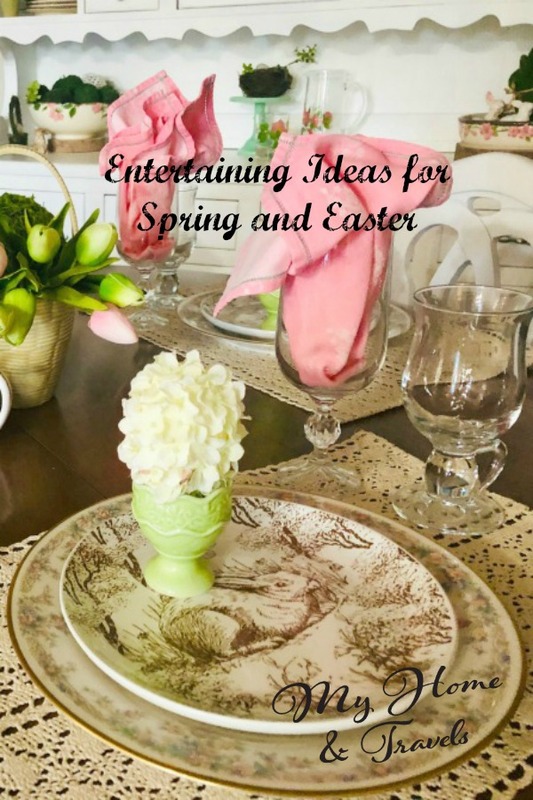 I want to help you with a few easy entertaining ideas for Spring and Easter to make your life a bit easier. Are you hosting dinner this weekend or another event? Maybe you have a family event and you are in charge of food, or at least organizing it. The food is usually the centerpiece of any get-together and sets the tone. Don’t think you have to do it all yourself. That has been hard for me over the years but I have learned to let go. If someone asks to bring something – let them. If they offer to help – let them. You will realize that someone else’s mashed potatoes aren’t yours, but guess what? They will be enjoyed by your guests just as much. Have a plan, menu and list. Or several lists.This can be from a shopping list, grocery list, to do list, or even things to do around the house. And keep a copy of these lists for your next event. Not everything has to be homemade. You can pick up great food, even complete meals at places such as Fresh Market. 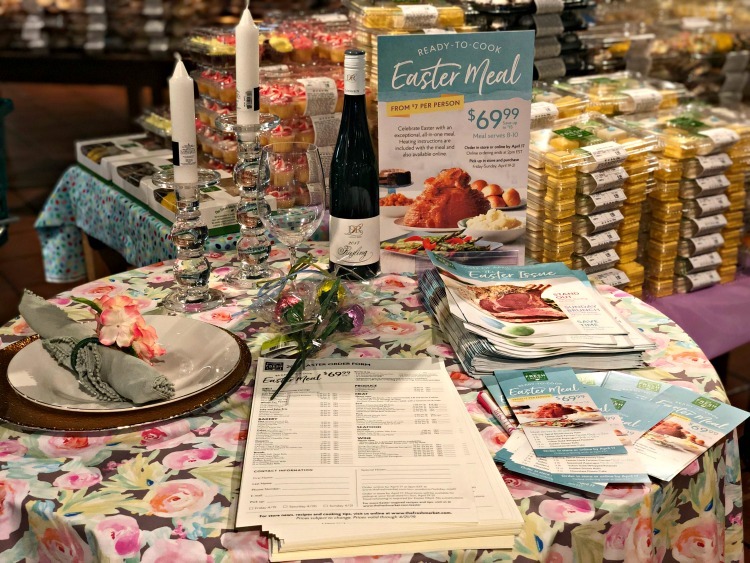 You can order a ready to cook (actually reheat) Easter Meal from Fresh Market for only 69.99**. This will include ham, 3 sides, rolls and dessert and feed 8 – 10 people. Think about what a time saver this is for you. Most places will a taste test of items too. Try before you buy. Dress up store bought items when you serve. Maybe add toasted almonds to the broccoli salad or caramel sauce to drizzle on the apple pie. Check with your local store for deadlines and pick up times. ** The deadline for pre-order for complete meal is order but check with stores what is available, or the deli counter is always full. If someone wants to bring something to the dinner and you know (and they know) they can’t cook, suggest a bottle of wine, a pre-made dessert (key lime tarts are my husbands favorite), or a pound of potato or broccoli salad from the deli. Planning the meal may be one of the first things you think about, but think about how, and where, you are serving it. Is it a sit down dinner? Buffet or brunch? Do you have enough dinnerware, bar ware, and silverware? You can borrow some if needed. Not everything has to match. This is when having plain white dinnerware comes in handy. Not all of mine are the same – some round, some square, and even a few rectangle plates, but they “go together”. Dollar Tree and Ikea are great places to pick up plain white dishes and even tumblers or stemmed glasses. If you buy a glass for $1, and it gets broken, so what. Make a few trips to yard sales to start you a great collection for entertaining. Cloth napkins are something else I tend to collect to use. White and ecru are my go-to colors but I keep in mind those which would match dishes I have. 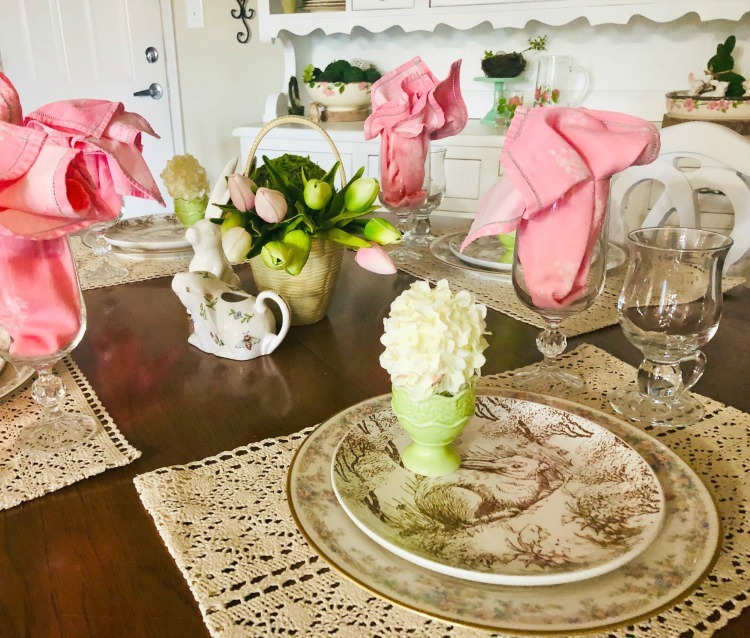 Do what you can ahead of time whether that is preparing most of the food, but also, setting the table, making sure you have the right size serving dishes, and chairs. 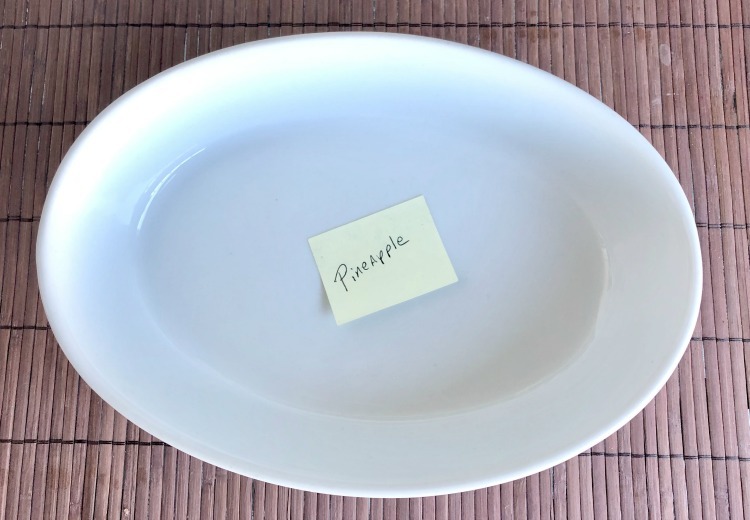 I have even set out all the serving dishes on the sideboard or bar and labeled them with a post-it note so I know if I need anything else. Remember to take into account what others might be bringing also so you can plan the space and possibly even a serving dish. On my list is things also like making sure a clean towel is out in the bathroom, lighting any candles, and having plenty of ice. Among my lists, I will even have a time schedule. This can be important too for oven space if you are warming up your meal or if someone brings something to warm up. Crock pots are great to utilize during this time as well. More is not always better. As I have downsized, and got older, I tend to go a bit more simple with things I love. 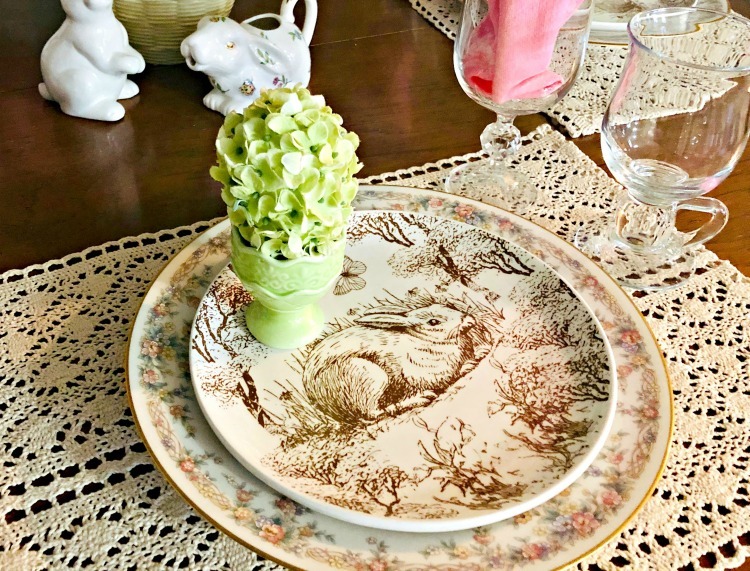 I have always wanted bunny plates and found these at Hobby Lobby this year. I love the brown in it so I can use it longer than just Easter. BTW – I love bunnies. Paired with my Noritake Gallery China, it’s mixing the formal with the casual. Kind of my life these days. 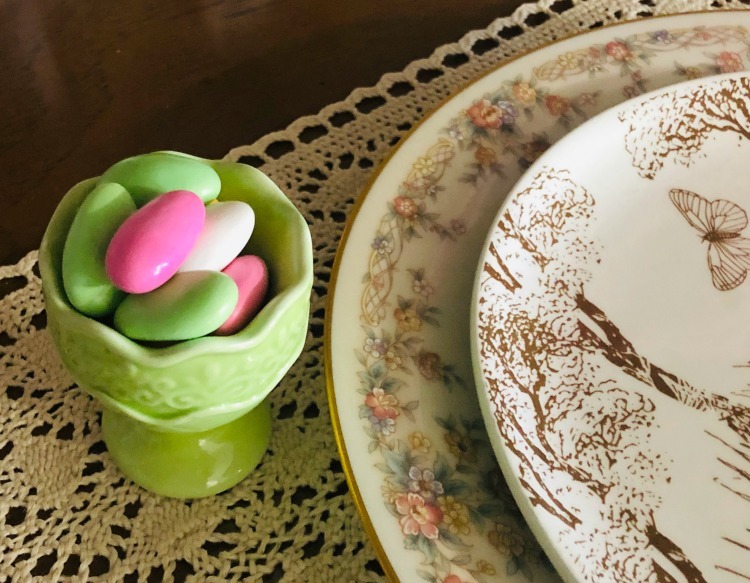 A little treat for your guests – Jordan almonds in an egg cup. These can be picked up at most craft stores, or a place great for holiday decor is Cracker Barrel. Always look for them on sale. If you take food or flowers as a hostess gift, make sure to take them in a container so the hostess won’t have to find something to put them in. 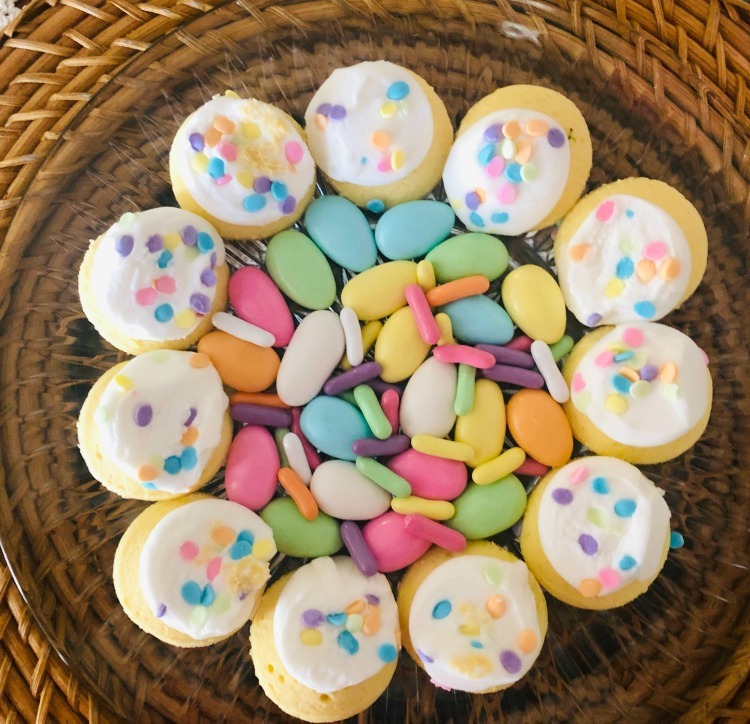 Even store bought cookies will look nicer on a plate and garnished with candy. 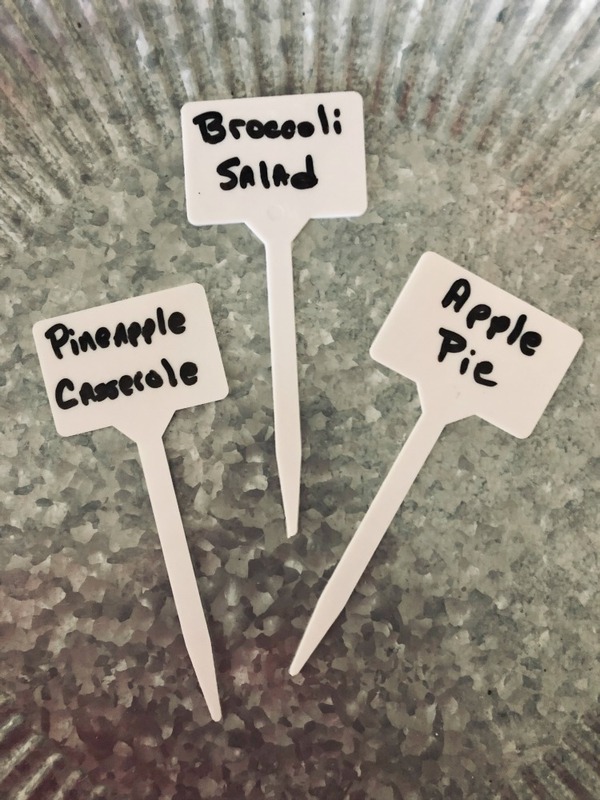 Make markers for your food. These plant markers I found at Dollar Tree is easy to use with a dry erase marker. Maybe if you are planning a smaller dinner and don’t want to go with traditional Ham, I always love a good standing rib roast. Add potatoes and salad, and that’s a meal to me. Oh, don’t forget dessert though. I love shopping at Fresh Market and it’s actually within walking distance for me. 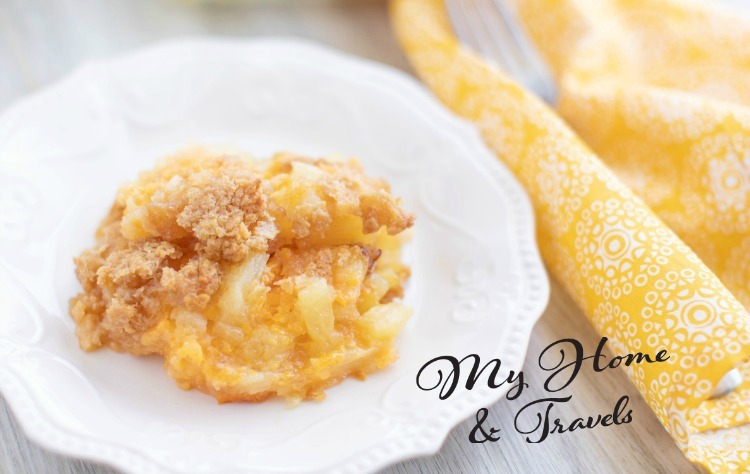 One of my favorite side dishes for almost any meal is Baked Pineapple Casserole. Yummy at any meal, but it goes great with ham and turkey. 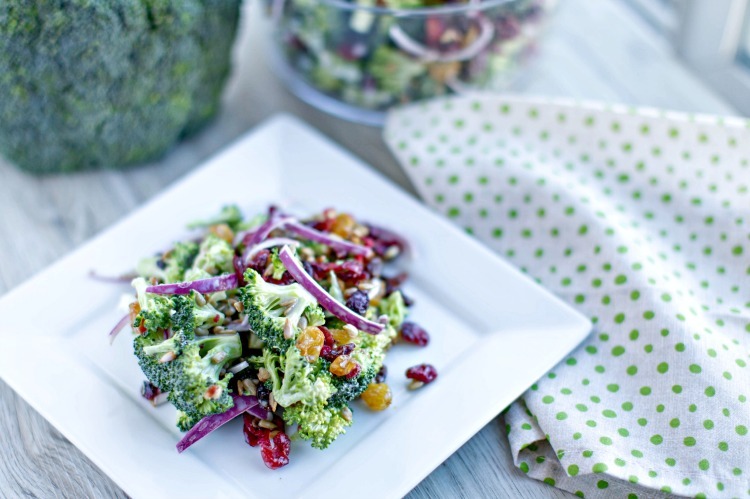 Another favorite for this time of year is my Broccoli and Bacon Salad. What are your plans for Easter? Any egg hunts for adults or kids? Making an Easter Basket? Don’t forget to pin these ideas or recipes for later. Do you follow me?